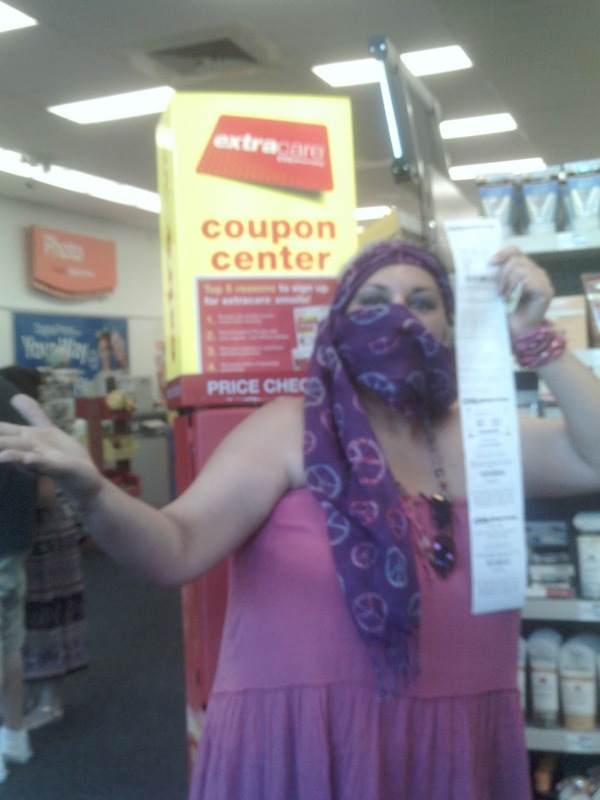 Babushka is a coupon clipping, card carrying, green tag using, CVS daily visiting 1st Generation Cuban American who loves her cafe and her local CVS. Babushka is a believer of being true to herself and her gustos without having to work too hard.That's why she loves CVS,which to her is Convenient Vivacious Style. Perfecto for BB! And y'all know BB by now, I don't post what I don't feel and CVS really is perfect for me. My home Up North in The South has a neighborhood CVS just 10 minutos away from mi casa and I plan strategically how to rack up my ECBs and daily visits using my Green Bag Tag. Que queeee? You don't know about ECBs and the Green Bag Tag? JU SO FONII!! Oh wonderful ones, BB will now let you in on the weapons of the modern day hunt. First step- get yourself an ExtraCare Card. That's the little red card up above. You'll find them at CVS, and each time you make a purchase you get points towards various rewards, coupons and- even cash! Actually, you receive ECBs which stands for Extra Care Bucks-same as cash for store purchases. Bueno, now that I've got your attention, we go to the second step- the Green Bag Tag. This is one of those twofer things that BB likes. You get $1 back after 4 separate day purchases and you save the environment by using a reusable bag or declining a shopping bag. Viste? 2 great things out of 1 item. 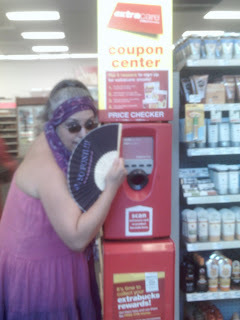 Don't start stressing by imagining toting around a giant coupon binder. No coupons needed for the $1 back, just make sure to scan the pretty green to get your green. ﻿Go on up to Big Red, don't be timid, he's a big softie! "Show me what you've got Big Boy!" It's like playing the slot machines, only this is a sure thing. Out comes offers, coupons and sometimes ECBs! The marvelous people at CVS want to help my readers with their savings by offering 5 of you a Green Bag Tag of your own. These cuties retail for $1 and are worth so much more considering the cash back you get and the trees you are saving. A win, win for everyone!! Just comment below what's your fave thing about CVS, their program, or what you plan to buy with your first dollar back. Winner will be announced on Monday, June 4. Good luck to all- and don't forget to include your email address in your comment. P.S. I w﻿as given a Green Bag Tag for my personal use and 5 tags for my readers. This was the only item received for my post and all opinions expressed are my own. P.P.S. Denisse has a wonderful blog for Spanish readers with more details on using coupons along with the tags and for English readers, my fellow Groovy Grandma- Grandma Juice is a pro and cut up on this and so many other things! P.P.P.S. The link for swagbucks is my referral link- if you like getting free stuff for searching & other fun tasks, please feel free to sign up. I like that CVS is so generous with their Green Bag Tag reward. My city won't allow stores to give us free plastic or paper bags anymore so we have to bring our own bags so CVS' reward is like icing on the cake. Are you serious? Cities can do that? Oh my. Bueno, then this would be perfection for you wouldn't it? Thanks for commenting and hope to see you dancing here again! Only you could make coupons sound so much fun. I agree with BellaVida!! I smiled throughout the entire post!! Now aren't y'all the sweetest? Thank you so much for saying that and for stopping by. let me tell ya, i love CVS as well....I can spend hours there everytime I go....great post amiga!